(Phys.org)—From young science students taking their cups and metals to the lab, to older inventors demonstrating their prototypes, it is no secret that salt water can be utilized as a conductor of electricity. Japan's Green House company is still managing to surprise everyone with its upcoming LED lantern that runs on just salt and water. Its forgettable product title is for a device that is simple enough. 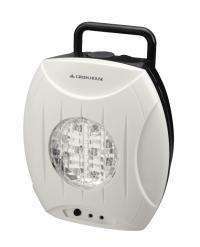 The "GH-LED10WBW" does not need any dry cell or rechargeable battery. Using a dedicated water bag, the water and salt once placed in the lantern produces light, pure and simple. The lantern can generate electricity for eight hours per charge of water. You just keep refilling the bag every eight hours for continued light. Inside the lantern is a magnesium rod, negative electrode, and a carbon rod, positive electrode. The magnesium rod can be used for up to 120 hours of power generation. One can replace this rod, which is to be separately sold. The lantern goes on sale this month. What is drawing added interest is that the lantern can double as a charger as well as light source. A USB port, on the casing could be used to plug in a smartphone or some other device in the event of a power outage. The company behind the lantern, Green House, prides itself on being "green." The company pledge is to enforce and implement "Green Policy" in its products, from using recyclable materials to generating less environmental pollution. No pricing information was available at the time of this writing. Ah, so it uses salt water as an electrolyte, and magnesium/carbon pair as a primary cell. Which means it does have a battery, which you have to replace, and the whole thing is just a semantical trick. Considering the magnesium ends up in the water bag and needs to be dumped regularly, this product is about as green as biofuel. magnesium isn't dangerous and most living things need it and very common in soil, etc. Yes it's a battery but just replacing the rod is likely to be far cheaper than throw away batteries with more waste. instead of having to buy even rods. Since LED's, etc are very cheap the locals need to build their own and build up the local economy and wean themselves off kerosene/diesel which is far more costly and badly pollutes inside their homes. The problem with using aluminium for a battery is that aluminium is made by molten salt electrolysis, which requires so much energy that it's better to recycle aluminium cans than try to turn them into batteries. Using magnesium like this is a bit dubious as well, because the waste gets dumped wherever and recycling it becomes impossible. ... what about the required water quality? ... how much water means a "charge of water"? Since magnesium is abundant and non-toxic it's pretty safe to just dump the water after use.